truth is pulling its boots on." 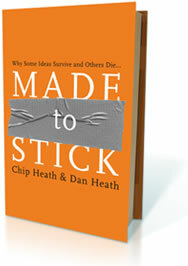 Chip and Dan Heath wrote a really cool book, "Made to Stick" about what makes some stories and marketing messages "stick" while others, even if part of massive advertising campaign, fail to resonate with their target audiences. In this book, they describe six key principles for how to communicate your message so that it sticks. One of the things that inhibits people from crafting simple messages is the curse of knowledge. The curse of knowledge occurs when the speaker cannot put themselves in the position of the audience because they are too familiar with the situation and assume information which is not evident. This happens frequently to experienced managers. They know too much! This book has lots of great stories and is a fun read. You'll find out about the guy who gets his kidney stolen and the truth about razors in Halloween candy.